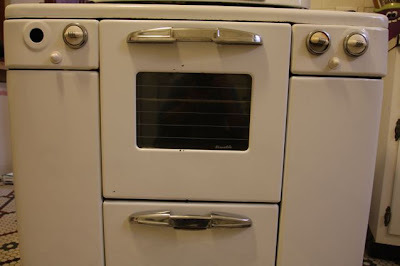 When I posted photos of Colby's pre-Tappan Deluxe stove, I noticed what looked like a little metal plate on the right side of the oven door and asked about it. 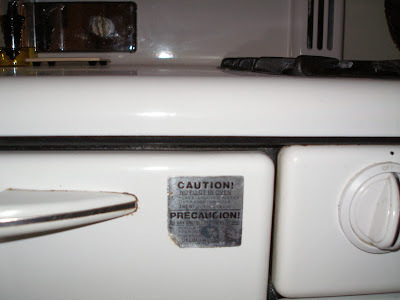 Colby sent me a close up picture of what turned out to be a metallic, bilingual warning sticker that says "...no pilot in the oven." We assume it is not original to the stove (although some stoves do have a warning on the metal control plate in the right storage area). Has anyone seen a sticker like this before? 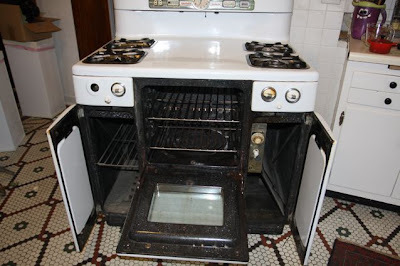 We had the idea that it might have been added by a previous owner when the house was sold.....or when the stove was worked on/restored....or by the gas company. 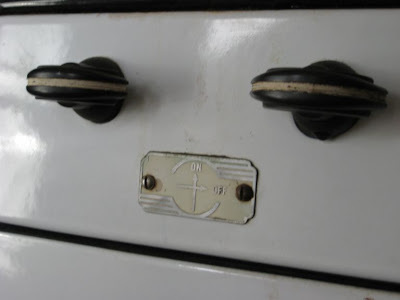 It was in my husband's grandmothers house and although some relatives were ready to throw the thing away because it was so filthy, an uncle lifted the door knob and the side door popped open seamlessly. Grandma wasn't a cook so for all those years it really hadn't been used much. It just needed a thorough cleaning. We've been using it since 1993. It's now beginning to fail. The oven is burning everything and we suspect it's the thermostat. It cooks everything as if we have set the oven to 500 degrees. We've muddled through all the other issues - like the electrical system shorting out. The clock was buzzing constantly. The oven light popped and went out. However, we can't use the oven if we need to control the heat by leaving the door open! Sigh. Been thinking about getting it restored but am terrified of the potential cost. On the plus side - replacing it with a stove of the same size might cost the same. It might be a no-brainer. We love this stove and it's had only 2 owners. Grandma and us! The control panel at the top includes a scrolling menu of cooking times. It struck me as rather funny the first time I saw it. Grandma also left the air freshener canisters that are included in the top of the control panel. Those were a bit nasty looking. The stove has been wonderful these past 17 years and is now in need of some TLC. It took me a second after reading her email to realize....she had an air freshener on her stove! I had read about these....I had seen a really crappy picture of one when I first became interested in Tappans.....but had not seen one again and NEVER in detail close-up. They are VERY rare. Tina was kind enough to send photos to share (click on photo to enlarge). She has them arrange from left to right to show the entire air freshener unit removed, the inside "freshener" and then the unit in its little compartment above the clock on the back splash. Cool (and notice her blue & yellow Tappan salt & pepper shakers). Tina also added the following info. in her email that may be helpful to others. Keep in mind, you use suggestions/info. here at your own risk. Shut off your gas! When In doubt, call in a pro. 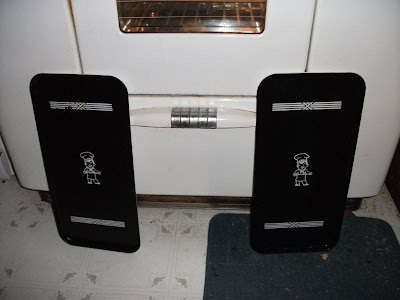 I don't know if this is useful but a few years ago, the oven kept going out. What we discovered is that the thermo-coupler was having trouble. [We] live in a dusty neighborhood and the gas delivery line was getting clogged. We took it apart, blew it out with canned air and put it back. Running like a champ since. 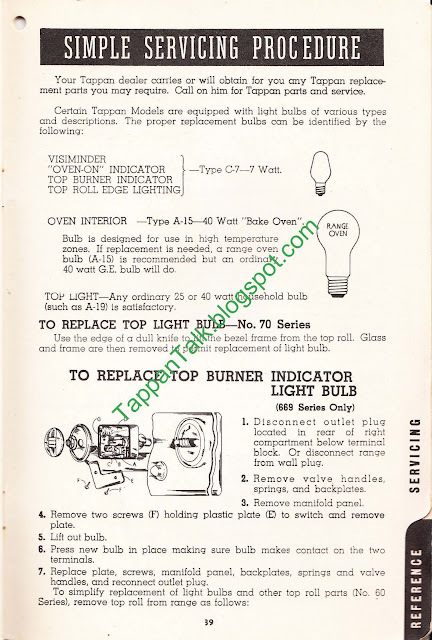 Here's some handy information on the wattage of light bulbs to use in your Tappan Deluxe. The bottom section includes instructions on replacing the burner lights, if you are lucky enough to have burner indication lights. The text in parenthesis says it applies only to 669 series, but in reality it also applies to 67, 667 and any earlier model that includes those lights. 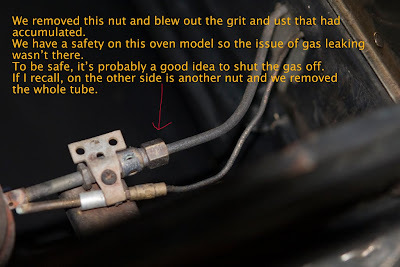 Removing the manifold (the little section covering the burner knob areas) is easy. 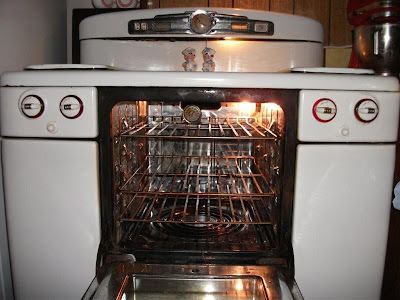 Mike wrote to me asking if I might have any information on where he could find an Owner's Manual or model # information for his 1959 stainless steel Tappan wall oven and cook top. It *may* be an EOV series. 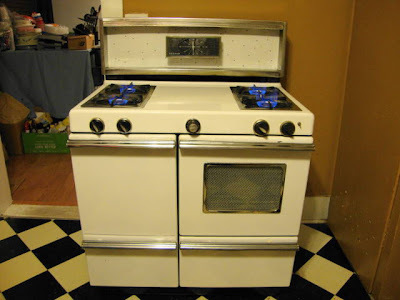 As with most vintage items, the 1950-60 stoves seems to have magically moved from the "That's an old stove we need to replace" phase to the "Wow, that's a mid-century stove that would be perfect in our mid-century house" mode. Although, I have to admit that I don't think there is any way that Mike's stainless steel wall oven and cooktop were *ever* out of style. Look at the control panel on the oven....does it get any better?! Thanks Mike, for sharing your pictures. 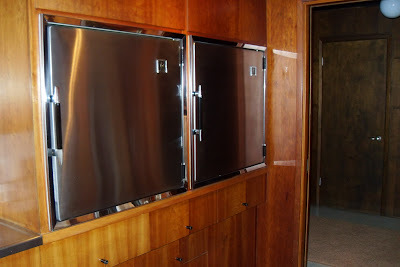 A few weeks ago I wrote a post about an American Express television ad that appeared to feature a Tappan Deluxe storage door. 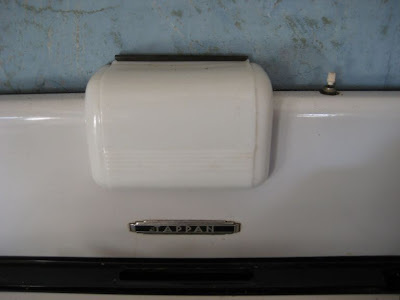 The other day, I received an email from Ron and Aiden that mentioned a few more places that they had seen a vintage Tappan Deluxe stove "out in the wild." I got to thinking that it might be fun to start a thread of vintage Tappan "sightings." If you have a "sighting," I'd love to get a note from you and I'll try to feature it in a blog post. So, our second official "sightings" post is brought to us courtesy of a tip from Ron and Aiden. 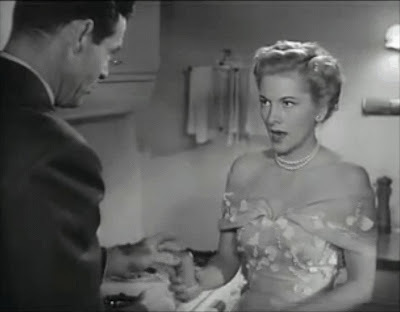 Born to Be Bad is described as a melodrama starring Joan Fontaine as a conniving woman who will stop at nothing to get what she wants (which evidently is a rich husband and an artsy boyfriend). 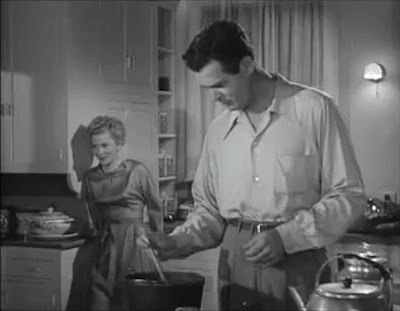 The movie was directed by Nicholas Ray (of Rebel Without a Cause fame) and released by RKO Radio Pictures (headed by Howard Hughes). 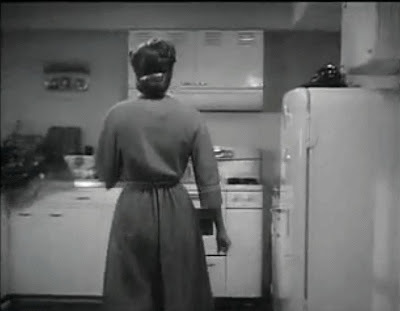 It was in production the summer of 1949 and released the summer of 1950 (obviously dating the stove). 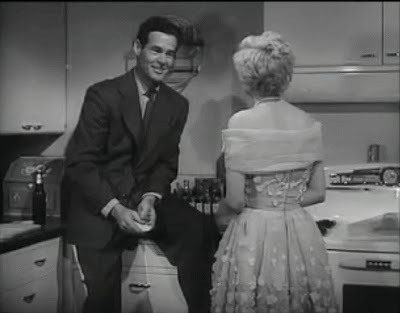 A few Tappan fanatic notes: There is a point in the movie where the actor asks the main character to hand him the salt. I watched that shot a bunch of times trying to see if the salt shaker was one of the Tappan shakers we know (I don't think so). There is a shot of that scene below. I was also curious about the cabinet above the stove. It looks like it might have a vent. I also stopped the scene a few times to try to figure out if the clock was a Timer or Telechron (I couldn't tell). 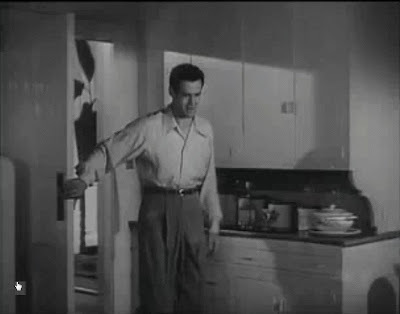 The last two photos are of another kitchen in the movie & I included them just because I love vintage kitchen cabinetry. 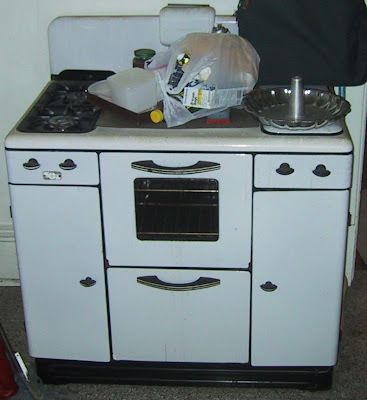 Colby emailed me photos of his stove and asked if I was able to tell him how old his Tappan stove is. 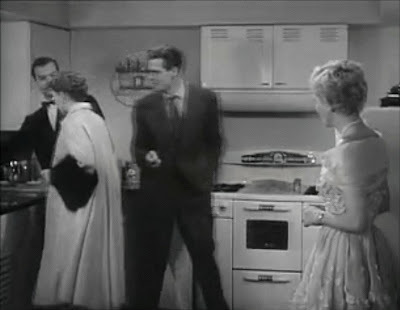 The stove was purchased with his 1930's bungalow and has the model # W-55. 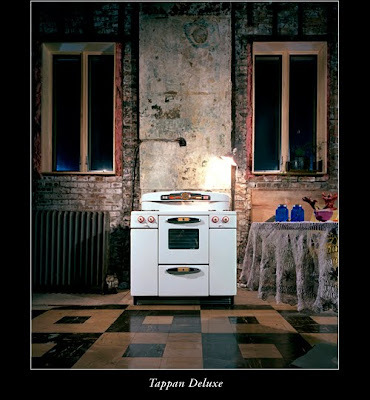 The stove is obviously pre-Tappan Deluxe...but has essentially the same body as the Deluxe (it's 38" wide). 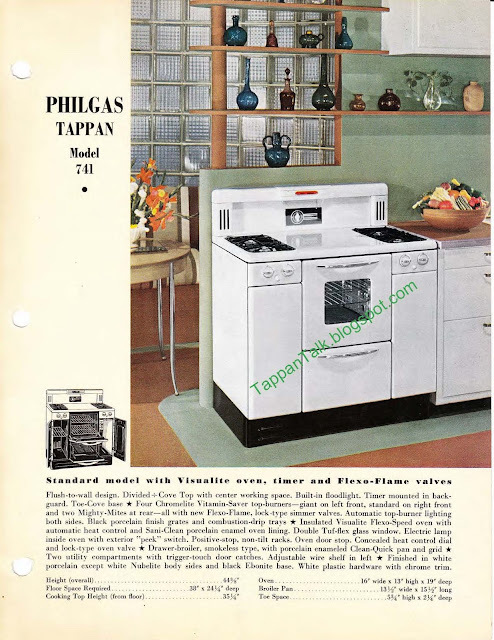 Whenever I see pictures of these earlier stoves, I pull out the Sales Manuals I have for 1940 and 1941 Tappan Philgas stoves. 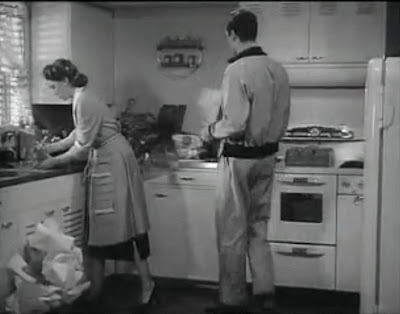 Sure enough, I was able to find an almost identical stove in the 1941 Ads. Colby's stove is not a Philgas, but it narrows down the year of his stove to the early 1940's. One item, Colby's stove has that the Philgas (model # 541) stove does not have is a timer on the back splash. 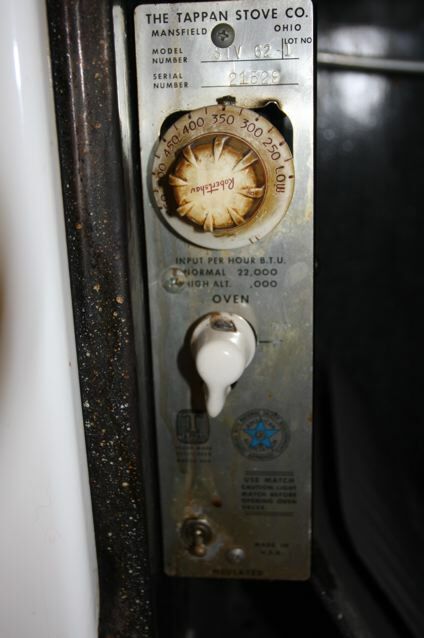 Tappan also made a Philgas model #741 that included a back splash timer, but had a window in the oven door that Colby's does not. The Philgas Tappan model 541 sold for $118.50 in 1941. Colby, what do you think? Make sense? Also, I'm curious...what does that patch on the oven door say? Amy emailed me a few weeks ago to see if I had any information about her stove as she was planning on selling it. She was able to find the model number under the right burners - DCV-5776 13 with the serial # K08 1418. Her house was built in 1948 and the stove was included when she bought it. She described the stove as a gas, four burner stove, white, 36 inches wide. The oven in on the right, with a broiler underneath. On the left is a storage area. There's a large clock on the top front. I haven't been able to discover too much yet about the Tappan models that followed the Deluxe, but in looking at the back splash and clock, we came to the conclusion that this stove was most likely late 1950's. My favorite feature of the entire stove is the back splash....especially the clock. (Amy just sent me an update - she was able to sell her stove to a theater group that is going to use it in one of their productions.) Thanks, Amy! I've been exchanging emails with Aiden (whose stove I highlighted in my previous post). 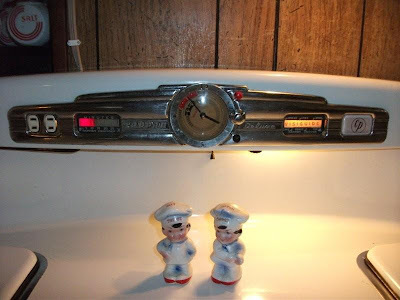 Ron & Aiden were in the envious position of being able to meet the original owner of their stove, as well as having a friend who worked for Tappan. So, they have a ton of interesting tidbits of information. Information worth capturing. With permission, I am posting parts of our email conversation here (my comments are in bold, with Aiden's response following). Wow, great story and pictures! I just put a post about your stove up on my blog. My stove is also a 1948 or 49 model (but without all the bells & whistles yours has). I love the info. about the insulation - I'll have to remember to post more about that from the Owner's Manual on the blog later. Your time control clock is very cool looking - the chrome knob and edging are nice. I use the "heavily insulated" oven feature a lot - the pilot keeps things warm, and ours has the light that stays on - not the "peek-a-boo" light on later models - so the oven can always be warm. I use that to soften butter for cookies or other baking - and sometimes leave it in there long enough to be "brush-ready" for toasted cheese sandwiches and the like. Interesting that you have the Tappan Chef salt and pepper shakers. I had found info. that they were earlier than the McKee blue & yellow shakers, but was never able to prove it. They were in the drawer in the thermostat compartment when we bought it, so they're 1948. We really like 'em. Don't know if our pictures showed any of the "Vitroc" condiment set on the left of the stove but they're from Ron's family home and in mint condition (and used constantly). Thanks for the comment about the KitchenAid, too - it's a "rebuild" of a much older model, and we had it enameled red to match the black, white and red kitchen tiles in another place we lived. It gets used as much as the Tappan! Does your Owner's Manual have a date after the introduction? It seems those manuals were printed every few months...I've been trying to keep a list of dates that they were published. We'll go over it with a fine-tooth comb, but can't find an actual date. 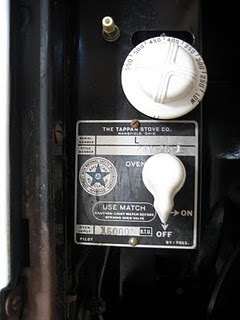 A comment about the Robertshaw thermostat you'd mentioned in your blog: it was our understanding, from someone who worked for Tappan in Ohio way back when, that they USED the Robertshaw quipment, but the Robertshaw firm wasn't "credited." Our thermostat knob does not say Robertshaw - it's very much the usual Tappan knob. 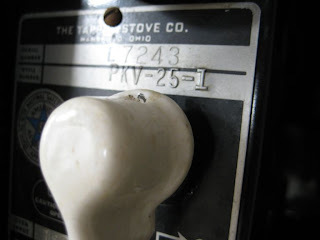 But we did look at a stove - from the 1950s - that DID have a thermostat knob that clearly said Robertshaw. When we spoke to our friend who worked for Tappan, he mentioned that they were built a lot like the old Packard automobiles - by hand. Yes, there was an assembly line production, but sometimes the "details" were a mixed bag as new things were tried. Purchasers were always encouraged to fill out the reply card (those folded, stamped envelope things that one filled out and then licked and mailed), because that's how they knew what was working. After we purchased and installed this stove, we sent pictures to our friend not long before he died - he IMMEDIATELY identified it without a second guess. He said that Tappan always took great pride in their work, and they listened to housewives and others about what was convenient and would WORK - like the Telechron stuff. Ah, it sounds like you have the cream colored (with aqua writing on the cover) Owners Manual. From what I understand, your clock would be the Timer Control Clock (the Telechron Clock didn't work the stove & has two knobs w/ a plain timer). Yup. Our mistake. You got it right. However, our late "Tappan guy" said that the movement is Telechron - sealed oil movement - it's absolutely silent and never skips a beat. Wow, what a great resource! Here's the funny thing..I follow a lot of old car restoration sites because I find their process is very similar to stove restoration. When I bought my stove off of Craigslist, I brought along a friend of mine (safety) who is really into vintage cars. I was surprised at how interested he became in the whole vintage stove search. There is something very similar between the two machines. And organs and trains. It seems like all the really GOOD American stuff is gone: Packard motor cars, Kimball pipe organs, the Burlington Zephyr (now in a museum) - and those great old Tappan stoves. All of those things were American engineering at its finest and most clever - engineers had to sit down and physically DRAW all that stuff, and then pattern makers and tool-and-die guys had to get busy. That's why they're built like tanks. As our "Tappan guy" said - "a lot of material that went into that stuff was good wartime production metal." Not like today. Plastic and paper. Your stove *really* must have been cutting edge at the time. My stove is a 1948-49 and is non-cp, has the Telechron clock (no oven control), and no crispers (which Sales Room brochure I have says first formally introduced en masse in 1950). Even your all chrome backsplash is special....in all of the Deluxe I've seen, I haven't seen an all chrome one (Except the Super 60 model). Your stove must have been very high end. We were given to understand - from the little old lady who learned to cook on it as a bride - that a special deal was worked out with "the stove people" (her words) for all the stoves in "the circle" - the area where she lived. A contractor busied himself scrambling to build about 30 G.I. loan bungalows and they were all outfitted with these stoves. So - indeed - our "Tappan guy" even suggested that the company may well have seen an opportunity to try out various features before they became standard. It is truly sad that - literally - this is the ONLY one of those stoves we can find that survived. That same lady also told us she could never figure out the clock and how to set it to use the oven. Admittedly, the first couple of times, it's a little confusing - but after it's been done once - we find ourselves using that feature and the "auto" outlet and just about everything else all the time - the thing is a wonder. Incidentally, we notice that one owner calls his "Precious." We call this old girl "Mighty Whitey." So, your oven light turns on/off by the brown knob at the bottom of the main control panel?...but doesn't have the mechanism that turns it on and off when the door is open and shut? It turns on and remains on via the knob, yes. There's no mechanism for on/off through opening and closing the oven door. The lady said that this was a feature she used, and is reminiscent of the ad slogan (which she knew): "Watch it happen in your Tappan." I wish your friend was still alive....I've been dying of curiosity trying to figure out why my oven light socket was never installed (it just was packed in the insulation). Our bet it was a goof on somebody's part. That happened. Our guy used to laugh about a couple of stoves that made it out of the factory without several things every now and then. It happened in those days when manufacturing was more "hands-on." Truly, we miss our buddy - he was the source of many a good story and a lot of history. Aiden, again, thanks so much for letting me share this information on Tappan Talk! This afternoon I received an email from Ron and Aiden regarding their 1948 Tappan Deluxe Model AV667-12 named "Mighty Whitey". Their Deluxe stove has the red burner knob backs (I love that the Kitchenaid mixer matches), a pair of the Tappan Chef salt and pepper shakers (which match their burner covers), the Time Control Clock has a chrome center knob (which I haven't seen before) and their back splash light has a pull chain. We encountered this on a CraigsList ad in St. Louis. It was a one-owner: a war bride who had a veteran husband, a G.I. loan bungalow and this as the stove she learned to cook on. 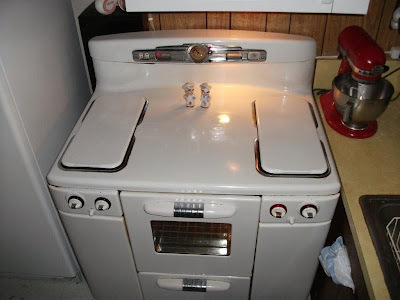 We grabbed it for thirty bucks, hooked it up and it works flawlessly, even to the Telechron clock and the set-it-and-forget-it timer mechanism, used almost daily for the oven or for the "clock" plug - such as for the slowcooker. Attached are pictures of the beast. It IS a CP model. The only "addition" we've made was to locate the burner covers, which apparently came with the stove but disappeared many years ago - we located a perfectly pristine set on e-bay. This thing is built like an aircraft carrier and NEVER lets us down. It came with THREE oven racks, so batches of cookies in perfect condition come out every time! And the owner's manual is entirely right: the oven is so heavily insulated, we often have the clock (or manually) turn off the oven and let the residual heat finish baking for us. 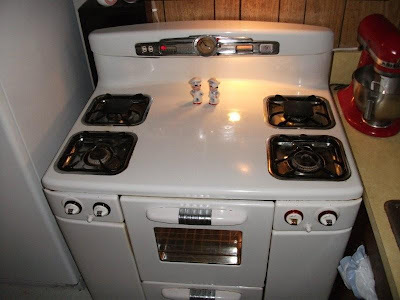 When we bought the house, it had a two-year-old "cooktop" electric stove, which Ron (who cooks constantly) hated, so we disconnected it, gave it to Aiden's mother for Christmas (she's scared of gas) and hooked up the Tappan. It LITERALLY cut our energy bills by a full one-third. Just thought we'd chime in! Thanks for sharing both the pictures and the story! This is Joe B's stove in Chicago. 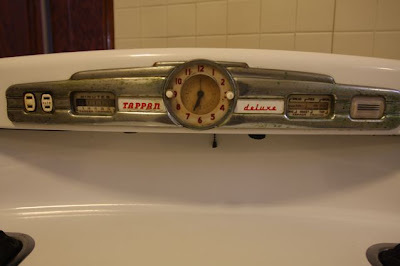 He just rediscovered this Tappan Deluxe in a former tenant's apartment. The Model # is STV 62-1. 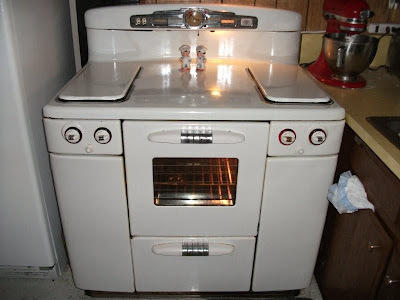 This stove is very similar to mine except that it has chrome oven/broiler handles, as well as chrome burner knob backs. The chrome burner backs seems to be on the rare side; I don't see them very often. You can spot the original white burner covers stored in the side storage doors. This is an earlier Tappan Deluxe so it is a non-CP model. you can also spot the chain hanging down from the back splash to turn on the light (later models have a switch). This stove has a Telechron clock (you can tell by the two white knobs). The Robert Shaw thermostat knob is a little unusual - I'm still trying to learn about those, so I can comment too much other than to make note. Joe is currently working on getting the burners and burner knobs back in working order. 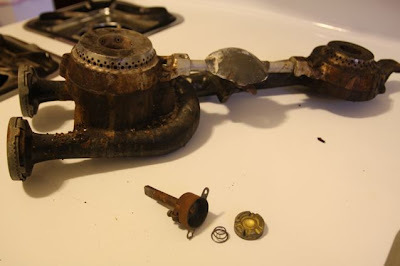 The last shot is particularly interesting because it shows the burner knob taken apart (note the spring). Oh, a get a look at that oh-so-cool ceramic hex floor tile! Thanks Joe B - keep us posted on the burners. Chaz sent on some additional pictures of his pre-Deluxe Tappan stove for our enjoyment. We figure this stove was just pre-Deluxe. You can already see the Deluxe design. You can read more directly from Chaz on his blog. 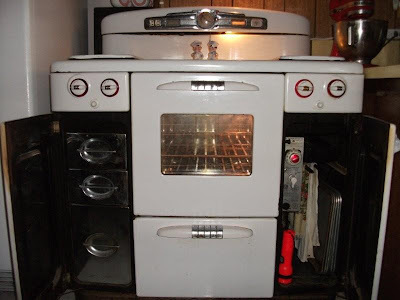 According to the vintage sales material I have, the handles on this stove's burners and storage compartments were just changing over to the Deluxe style around 1940. I particularly like the back splash on this stove with the "opal glass floodlight" (as the sales brochure calls it). The metal sign showing how to turn the burner knobs is charming. I also like the written instructing how how to light the oven pilot. I think the white switch above the thermostat knob on the main control panel is a "peek switch" to turn on the oven light. 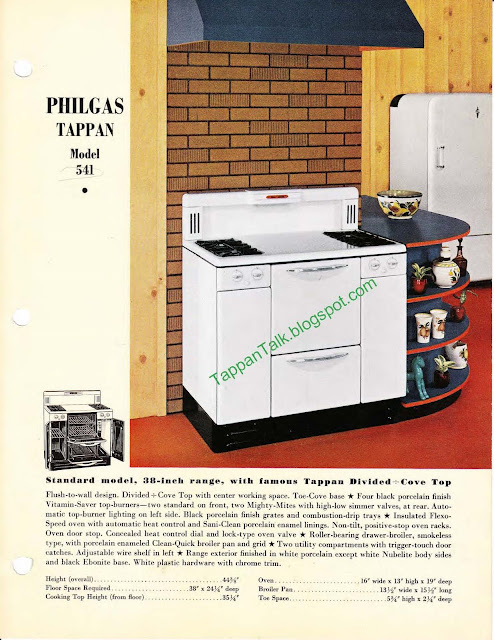 At first we thought this was a Tappan-Philgas stove, but the more I look at the photos, I think it was a Tappan stove propane that was made at about the same time as they were making gas stoves for Philgas. 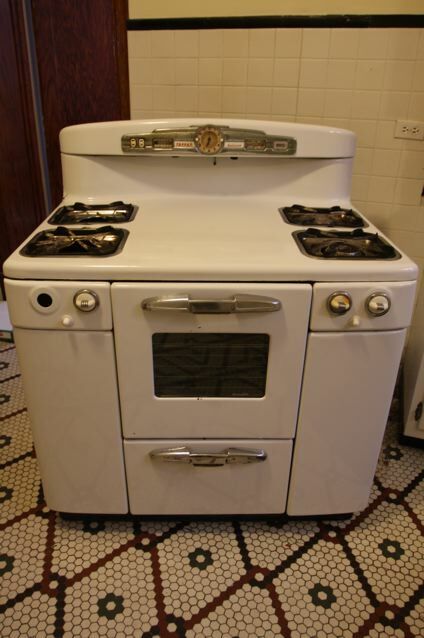 It doesn't have the typical "Philgas" badges, the model number doesn't seem to follow the Philgas-Tappan system (which would make this a 1943 stove), and the badge on the back splash says "Tappan" alone. Chaz, what do you think? Possible? @clockhistory says NOT to turn the gear with a pliers like they do in the video....and the NOS H and S rotors are still available - if coil hums but gears doesn't turn, the rotor is the problem. For rotors go to timesavers.com, search for "rotor", you'll see S (the smaller type) and H rotors. I have not tried the steps in the video, so try it at your own risk (although I can't see much that could go wrong) I am very interested to hear from anyone that does get a non-working clock going again. The video is actually quite good to watch, even if your Telechron clock is currently working.